We do not grow or sell anything that has been genetically modified. GMO stands for 'genetically modified organisms' - seeds and plants whose DNA has been artificially altered. We, too, are concerned over the growing use of GMO seeds in commercial farming, but be assured that we are GMO free. Hybrids are not genetically engineered plants! Hybrids have been occurring naturally since the dawn of time; bees are responsible for spreading the pollen from one variety to another and creating a new 'child', so to speak. The original parent plants remain the same, but the seeds that are inside the fruits produced will be a new, hybrid variety. Nothing unnatural in that ~ it is the way we improve upon the plant. We learned how to hybridize from nature using high tech equipment including a tiny brush and a paper bag! We do grow a few hybrids including Datura 'Ballerina' and 'Evening Fragrance', Artichoke 'Imperial Star' as well as Basil 'Genovese' and 'Siam Queen'. Most of our seed grown plants are open pollinated species; these varieties pollinate themselves with the assistance from birds, bees and wind. The seeds of open-pollinated varieties can be saved, and the traits that were favored in the 'parents' will be transferred to the seed of the future. We grow some of our own seeds. Each season we select herb plants in our test gardens for seed collection; we may have trouble finding seeds for the more unusual herbs, or we feel that we have seen better germination with our own seeds. We are not USDA Certified Organic. We are, however, committed to a ' greener way of growing' and have been for over 30 years. We are a small family owned, family operated farm and we understand that our customers want assurances that they are buying herbs that have been grown from non-GMO seeds as well as being grown using sound practices. Rest Assured. Our plants have never been subjected to synthetically manufactured pesticides. For example, we use concentrated Hydrogen Peroxide as our disinfectant. Our soil fungus control is a live form of bacillus which basically 'eats' the fungus. Pyrethrum, an insect controller, is derived from the roots of the Pyrethrum plant. None of these substances are highly toxic and all quickly break own to harmless compounds. Our greenhouses and pesticide application records are inspected by the Virginia Department of Agriculture, and most importantly, we are with our plants each and every day. We use a wide range of organically certified agents that allow us to protect our crop, and keep it safe to pinch a leaf off to eat right in the greenhouse! We are committed to sound practices and have been since the day we started. Technology has made biologically safe greenhouse chemicals so readily available, and although this sounds counter intuitive, not being confined by the requirements of the USDA certification process, we are freer to adapt our growing methods and take advantage of the newest innovations in environmentally sound practices. 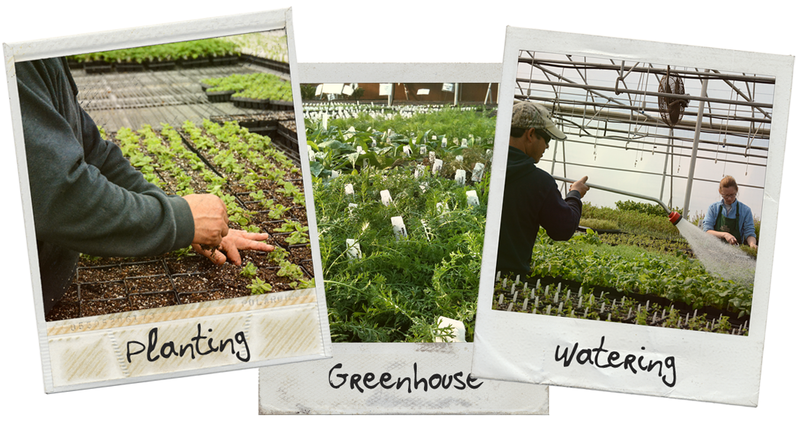 Our commitment to the environment goes beyond our growing practices. All of our cardboard boxes are made with post consumer products and are recyclable. We strive to use only biodegradable or recyclable packing material. All of our shipping is done via FEDEX and UPS, both of whom are the largest retail user of renewable, green power in the US. UPS has in place an extensive Environmental Management System for monitoring environmental performance and following up on any issues that arise from this monitoring. Our 10 greenhouses and office are located on our family-owned farm which has been under continuous cultivation since the founding of Jamestown. As part of our commitment to a healthy environment, we have devoted over 50 acres of former crop land as natural areas planted with a mix of prairie grasses, wildflowers and herbs. In addition to reducing our "carbon footprint", these filter strips provide a natural habitat for wildlife. Our farm is surrounded by the James River, America's Founding River, on three sides. We feel it is our duty as members of The James River Association and The Nature Conservancy of Virginia, to protect the river from agricultural activities. Prairie grass strips filter off any run-off from the fields before it can reach the river, putting us in 100% compliance with the Chesapeake Bay Act. Not only are we committed to our immediate environment, we also feel a duty to future generations. Our family is directly involved in various organizations that have a long term commitment to the environment. I am currently serving of the board of the VCU Rice River Center, my wife is a board member for the Virginia Nature Conservancy and my eldest son is now a board member for the Capital Trail, a pedestrian and bicycle trail connecting Virginia's past with the present. We are proud of our involvement, and feel it is important for you, our customers, to have a clear picture of both who we are and what we care about. 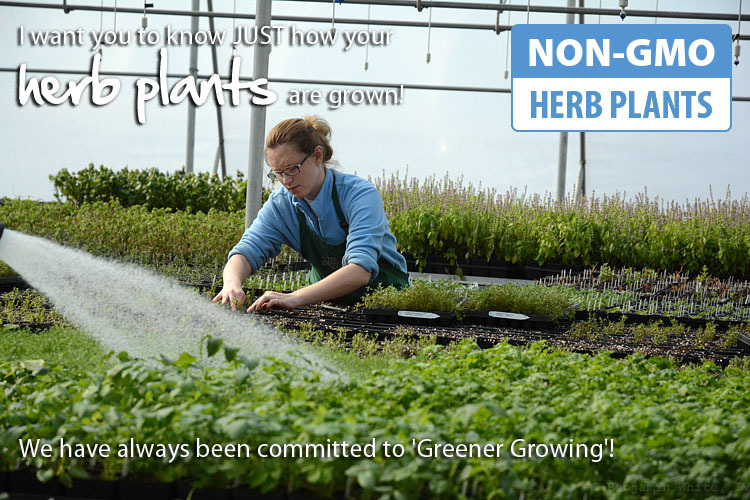 I want you to know JUST how your herbs are grown! We have always been committed to 'Greener Growing'!